This article is about the Interstate highway located in southeastern Idaho. For the Interstate highway that runs through New York and Pennsylvania, see Interstate 86 (Pennsylvania–New York). For the former alignment of I-86 east of East Hartford, Connecticut, see Interstate 84 (Pennsylvania–Massachusetts). Interstate 86 (I-86) is an east–west intrastate Interstate Highway located entirely within the state of Idaho. It runs approximately 63 miles (101 km) from an intersection with I-84 east of Declo in rural Cassia County, to an intersection with I-15 in Chubbuck, just north of Pocatello. The highway is part of the main route from Boise and Twin Falls to Idaho Falls and the upper Snake River region. I-86 runs through a sparsely-populated region along the south side of the Snake River and is mostly concurrent with U.S. Route 30 (US 30), which it replaced in the 1970s. It passes through American Falls at its midpoint and has a business route that serves the city center. The highway also serves the Minidoka National Wildlife Refuge, Massacre Rocks State Park, the Fort Hall Indian Reservation, and the Pocatello Regional Airport. The highway follows a section of the historic Oregon Trail, which was paved and incorporated into US 30N in 1926. Under the original numbering proposal for the Interstate Highway System released in 1957, the highway was supposed to be part of Interstate 82N, but it was instead designated as Interstate 15W. The first section of the freeway, near American Falls, was completed in 1959. 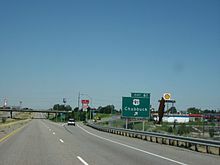 Other sections near Chubbuck and Pocatello were opened in 1968. I-15W was renumbered to I-86 in 1978, shortly before construction of its final section between Raft River and American Falls commenced. The highway was dedicated and opened to traffic on October 11, 1985. The entire route is in American Falls, Power County. ^ a b c d e "Interstate 86 Milepoint Log" (PDF). Idaho Transportation Department. January 25, 2016. Retrieved July 15, 2018. ^ a b c d Idaho Official State Highway Map (Map). 1:1,248,000. Idaho Transportation Department. 2016. OCLC 926912754. ^ a b c Google (July 14, 2018). "Interstate 86" (Map). Google Maps. Google. Retrieved July 14, 2018. ^ Johnson, David (May 6, 1990). "Idaho potatoes really are 'famous' in Power County". Lewiston Morning Tribune. Retrieved July 14, 2018. ^ Evensen, Kendra (August 3, 2011). "Wind farm project advances". Idaho State Journal. Pocatello, Idaho. ^ a b Bryce, Debbie (April 11, 2013). "Diamond In Rough: Most unique overpass in state making drivers, businesses irate". Idaho State Journal. Pocatello, Idaho. Retrieved July 14, 2018. ^ "Part VII - Miscellaneous Interstate Facts". Federal Highway Administration. Retrieved July 15, 2018. ^ "ATR & WIM Data: Interstate 86". Idaho Transportation Department. Retrieved July 15, 2018. ^ H.M. Gousha Company (1956). Shell Highway Map of Wyoming (Map). 1:1,203,840. Shell Oil Company. OCLC 575052172. Retrieved July 15, 2018 – via David Rumsey Historical Map Collection. ^ "Keeping track of the trail". Kansas City Star. May 23, 1993. p. A17. ^ Rand McNally Official 1925 Auto Trails Map: Idaho–Montana–Wyoming (Map). 1:1,393,920. Rand McNally. 1925. OCLC 992978006. Retrieved July 16, 2018 – via David Rumsey Historical Map Collection. ^ "Idaho" (Map). Rand McNally Junior Auto Road Map of Idaho. 1927. pp. 76–77. OCLC 921180471. Retrieved July 15, 2018 – via David Rumsey Historical Map Collection. ^ American Association of State Highway Officials (November 11, 1926). United States System of Highways Adopted for Uniform Marking by the American Association of State Highway Officials (Map). 1:7,000,000. Washington, D.C.: Bureau of Public Roads. OCLC 32889555. Retrieved July 16, 2018 – via University of North Texas Libraries. ^ a b "ITD Vault: Last gap in I-86 dedicated with ceremonies". The Transporter. Idaho Transportation Department. December 4, 2015. Retrieved July 15, 2018. ^ Bureau of Public Roads (September 1955). "Pocatello" (Map). General Location of National System of Interstate Highways Including All Additional Routes at Urban Areas Designated in September 1955. Government Printing Office. p. 19. OCLC 4165975. Retrieved July 16, 2018 – via Wikimedia Commons. ^ Klare, Gene (June 5, 1956). "Federal Road Plan Means East Idaho Super Highways". Idaho State Journal. Pocatello, Idaho. p. 5. Retrieved July 16, 2018 – via Newspapers.com. ^ National System of Interstate and Defense Highways, As of June, 1958 (Map). American Automobile Association. June 1958. Retrieved July 16, 2018 – via Library of Congress. ^ "Work Starts Soon on Four-Lane Interstate Highway Near A.F." Idaho State Journal. Pocatello, Idaho. April 21, 1958. p. 1. Retrieved July 15, 2018 – via Newspapers.com. ^ "Interstate Highway Opened Near A.F." Idaho State Journal. Pocatello, Idaho. February 29, 1960. p. B13. Retrieved July 15, 2018 – via Newspapers.com. ^ Rand McNally (1963). Official Highway Map of Idaho (Map). Idaho Transportation Department. OCLC 34000159. ^ "New Interstate to Provide Safer Driving for Motorist". Idaho State Journal. Pocatello, Idaho. July 3, 1968. p. B6. Retrieved July 15, 2018 – via Newspapers.com. ^ "Interstate 'Highway to Sky' Open West of City". Idaho State Journal. Pocatello, Idaho. October 20, 1968. p. A3. Retrieved July 16, 2018 – via Newspapers.com. ^ "Key Links on I-15 Expected Open Soon". Idaho State Journal. Pocatello, Idaho. August 27, 1972. p. A3. Retrieved July 16, 2018 – via Newspapers.com. ^ U.S. Route Numbering Subcommittee (June 20, 1972). "U.S. Route Numbering Subcommittee Agenda Showing Action Taken by the Executive Committee" (PDF) (Report). Washington, DC: American Association of State Highway Officials. p. 5. Retrieved July 16, 2018 – via Wikimedia Commons. ^ "Establishment of a Marking System of the Routes Comprising the National System of Interstate and Defense Highways" (PDF). American Association of State Highway and Transportation Officials. January 2000. Archived from the original (PDF) on November 1, 2006. Retrieved July 16, 2018. ^ Special Committee on U.S. Route Numbering (June 20, 1977). "Route Numbering Committee Agenda" (PDF) (Report). Washington, DC: American Association of State Highway and Transportation Officials. p. 1. Retrieved July 16, 2018 – via Wikimedia Commons. ^ "Interstate across Idaho will be I-84". Times-News. Twin Falls, Idaho. Associated Press. September 6, 1979. p. C3. Retrieved July 11, 2018 – via Newspapers.com. ^ Rand McNally. "Idaho" (Map). Rand McNally Road Atlas: United States, Canada, Mexico (1980 ed.). p. 25. LCCN 79-62950. OCLC 80747167. Retrieved July 15, 2018 – via The Internet Archive. ^ "Local highways improved". Times-News. Twin Falls, Idaho. October 4, 1979. p. B2. Retrieved July 15, 2018 – via Newspapers.com. ^ "Final portion of I-84 done". Times-News. Twin Falls, Idaho. October 5, 1985. p. A3. Retrieved July 15, 2018 – via Newspapers.com. ^ Bryce, Debbie (October 7, 2015). "Officials credit diamond design for fewer crashes at I-86 interchange". Idaho State Journal. Pocatello, Idaho. Retrieved July 16, 2018. ^ Google (July 15, 2018). "Interstate 86 Business (American Falls)" (Map). Google Maps. Google. Retrieved July 15, 2018. ^ "Minutes of the Regular Meeting of the Idaho Board of Highway Directors" (PDF). Idaho State Board of Highway Directors. September 12, 1972. p. 212. Retrieved July 15, 2018.